To understand the overall rate of 24.4% non-primary residence dwelling units at the Joyce census tract, one should split the area into the Wall Centre Central Park development (99.2% non primary residence units) and the rest of the CT (3.4% non-primary residence units). To understand the Marine Gateway CT (24% non-primary residence dwellings), it should be split inte the block with Marine Gateway development (13.7%), the block containing the MC2 development (67.4%), and the rest (10.1%). Comparing any of these very recent developments to the much older Coal Harbour makes no sense. Coal Harbor is still “filling in” although at a stubbornly slow rate. It will be interesting to see if the new vacancy tax can help speed that up. To understand the 24% non-primary residence units in the census tract containing the Marine Gateway development, we split the area into three parts. The block with the Marine Gateway development has in 460 dwelling units, 63 (13.7%) of which were found not to be primary residences. The block north of that containing MC2 had 570 dwelling units 394 (67.4%) of which were not used as primary dwellings. The remaining part of the CT as 1,507 dwelling units, 152 (10.1%) of which were not used as primary dwellings. What we see here quite nicely is how the rates of non-primary residence units are changing as the buildings they are in get older. Both Marine Gateway and MC2 are fairly recent projects, but Marine Gatway itself got completed about a year before MC2, and have significantly lower rates of non-primary residence homes. What needs further sleuthing is the rate of 10.1% for the rest of the CT, which is significantly higher than the baseline of 5.4% in 2011. There are no other larger pockets of increase of non-primary residence units in that area. This is might be best analysed in conjunction with similar increases in non-primary residence dwellings in some other single family neighbourhoods and goes beyond the scope of this short note. The story for Joyce-Collingwood is quite a bit cleaner (but holds some data complexities that manifest themselves in geocoding changes between censuses that can mess with fine-grained data). The articles focus on the increase by 609 CT-level non-primary residence dwelling units at Joyce. The articles hypothesise that “Speculation is one of our prime suspects” and “We don’t know why, but we know it’s concentrated in a few neighbourhoods.” without making any effort to look beyond CT-level data to find out. 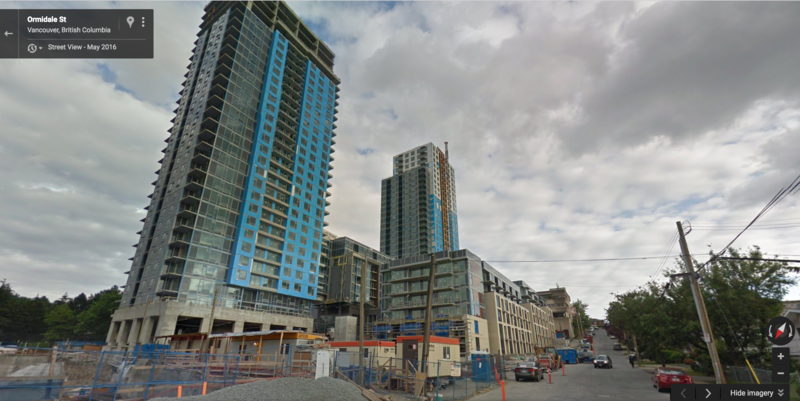 Diving in we see immediately that the Dissemination Block at the north-west corner of Kingsway and Boundary had 707 non-primary residence dwelling units in 2016, vs 3 in 2011. That’s a net change of 704 non-primary residence dwelling units in just that block. It block contains the Wall Centre Central Park development, that completed shortly before the census. The census counted 713 units, only 6 of which it found occupied. At the same time, population dropped by 161 people in this block, as the previous single family homes made way to the new development, easily explaining the drop in population by 57 in the CT level data that has people scratching their heads. So what’s the rate of non-primary residence buildings once we take out the Wall Centre Central Park that got completed just before the census? It’s 3.4%. Which explains why Jennifer Gray-Grant, executive director at Collingwood Neighbourhood House, was quoted finding the stat of 24% non-primary residence home “perplexing”. It is also interesting to look back through time to see the rates in 2006, when the area around Aberdeen Park had 18.1% non-primary residence units. I am guessing that some major building projects got completed in the year before the census, by 2011 the number of non-primary residence units dropped dramatically. 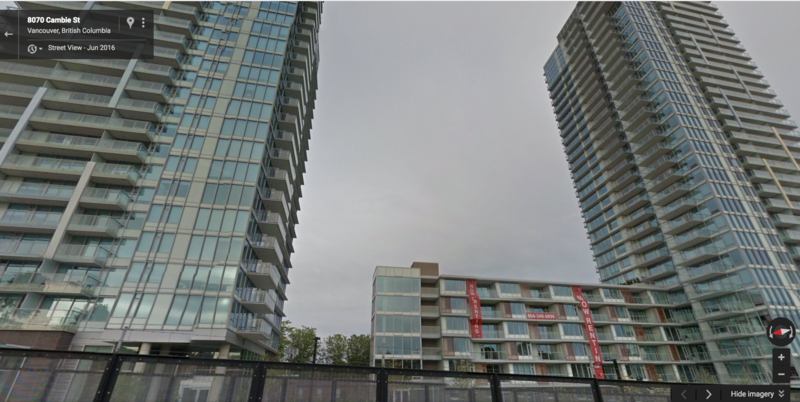 The high rate of non-primary resident units in 2011 in the Olympic Village should be seen in the context of the City’s decision not to sell the units below cost but hold onto the units and sell them at a later point when the market recovers, which eventually paid off. To understand the current overall rate of 9.4% non-primary residence units, it is instructional to simply zoom into the block level data and observe how the rates change depending on the completion time of the building.